The Psychologist is the only publication of its kind in the UK. If you are interested in human behaviour and what makes us tick, The Psychologist is the magazine for you. Packed with articles, letters, interviews, news, reviews, careers and jobs, it is the best way to keep up to date with all corners of the discipline. 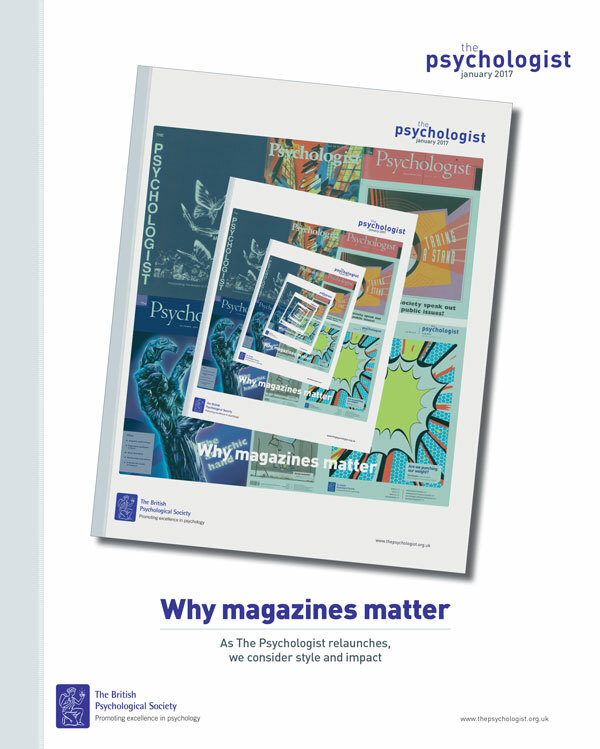 As the official monthly publication of The British Psychological Society, The Psychologist serves as a forum for communication, discussion and debate on a range of psychological topics. We publish a wide range of scientific, professional and personal formats aimed at our large and diverse audience: The Psychologist is read by more than 50,000 Society members in print, and many non-members view our open access offerings online and in our app. How can I get hold of The Psychologist? The Psychologist and The Psychologist Online is included with membership and Affiliate Subscribership of the Society. e-Subscribers have access to the Psychologist Online and in the app. If you are already a Society member, you can also view full digital editions of The Psychologist on desktop, tablet, smartphone etc by logging in. You can also download a PDF version for free via the BPS shop. If you are not a member of the Society, and would rather not sign up as an affiliate, you can view open access previews. Alternatively, you can download PDF versions of The Psychologist for just £3.60 via the BPS shop. You can also buy either annual access or individual editions via the app. If you are a psychology teacher interested in receiving complimentary copies as part of our schools and colleges subscriber scheme, please call +44 (0)116 252 9591 or e-mail [email protected]. We welcome contributions from psychologists in all areas of the discipline, written in an informative and engaging style. Articles may provide a broad overview of a particular area or issue, review the literature, include some original research, discuss theory, or debate applied issues and practical and professional problems. We do not publish articles based on research that has not been accepted for publication following peer review: i.e. we are a magazine, not a journal. We also have a host of regular formats which may suit you, including 'Rated', 'Reviews', 'Careers', 'New voices', 'Looking back' and 'One on one'. The Psychologist relies on your contributions, there are formats to suit all angles and levels of input, and a supportive editorial process to ensure that your message is presented in an appropriate and effective manner. The Psychologist is produced by a team of BPS staff. Dr Jon Sutton is the Managing Editor. He joined the Society in March 2000, from a psychology lectureship at Glasgow Caledonian University (go here for a summary of his academic work). Jon is responsible for all aspects of strategic development, budgeting, commissioning, editing, advertising and promotions, etc. He also oversees the Research Digest. His performance is monitored by the Psychologist and Digest Editorial Advisory Committee, to which he reports three times a year. You can find lots of his features and interviews here. Dr Annie Brookman-Byrne, Deputy Editor, joined in April 2019. Previously, she was an educational neuroscience researcher at Birkbeck, University of London. She investigated the cognitive and neural bases of science and maths reasoning in adolescence, using behavioural, neuroimaging, and classroom-based methods, working closely with teachers in school. Mike Thompson, Sub-editor, started before records began. He handles all the design and illustration in the publication. Our hugely popular Research Digest is available in a number of forms, including blog, app, email, Twitter, podcast, Facebook and Tumblr. It is edited by Dr Christian Jarrett. Check out some of his work, including the Rough Guide to Psychology, and his fantastic Twitter feed. Emma Young and Matthew Warren are regular contributors. Debbie Gordon, Editorial Assistant, joined in April 2008. She has a degree in Media and Music Technology. Our journalist, Ella Rhodes, joined us in June 2014. She is a psychology graduate and trained journalist, having previously worked on the Derby Telegraph. The office staff are supported by the voluntary associate editors and the Editorial Advisory Committee on the membership side (see the list on the contents page of the print version each month). We are currently looking for an Assistant Associate Editor for 'The Psychologist meets'. We run a range of more personal pieces, in print and online, including interviews, 'One on One' questionnaires and 'Careers' articles. Professor Gail Kinman is the Associate Editor, providing suggestions and interviewing people; now she needs some more support. This is a voluntary position: agreed expenses in conducting such duties will be reimbursed. It would suit someone who is well-connected and respected within psychology; who likes to meet others and is comfortable with conducting and transcribing interviews for publication; and who is keen to represent the diversity of the discipline and its membership. For more information and to put yourself forward, please contact the Managing Editor, Dr Jon Sutton. We are currently looking for an Associate Editor for our ‘Books’ section. We like to fill our ‘Books’ pages not just with traditional reviews of new books (though these remain at the heart of the section), but also with information about books presented in a variety of interesting ways. Among formats we have used are ‘My shelfie’, ‘What to read if…’, Q&As with authors, and ‘A book that shaped me’. The section embraces books about psychology, of course, but also books that have psychological content, including novels. One of our two Associate Editors is stepping down, and we are looking for someone who has a genuine love and enthusiasm for books, and broad interests and contacts both across and beyond the discipline. The Associate Editor will be essentially an ideas person who can creatively engage with what we are trying to achieve. This is a voluntary position. What are the policies of The Psychologist? Click here to download our policies. - what articles you found particularly engaging and / or informative, and what other topics you would like to see covered. Simply e-mail the editor. If your comments concern policy or the editor's performance, an alternative is the Chair of the Psychologist and Digest Policy Committee. Like what we do? Tell your friends and colleagues! The Psychologist relies heavily on our community giving time and expertise, and the more visible we are amongst that community the better. And, let's face it, the doors and walls of academics and practitioners are often in need of a dash of colour! So we have produced some flyers / posters for you to download, print and stick up or give out. - The Psychologist is your publication! - What can The Psychologist do for you?